Merjent is an environmental consulting firm serving clients throughout North America from our corporate headquarters in Minneapolis, MN and from numerous branch offices located conveniently near clients across the United States. Merjent was founded in 2004 by a small team of talented experienced professionals dedicated to providing environmental consulting services to the oil and gas industry. Our founders sought to set themselves apart by providing these services with integrity and efficiency in a cost-effective way. Their approach was a resounding success. Merjent has since expanded its focus and service areas to meet client needs and has grown to over 80 full-time employees, plus dozens of seasonal employees hired each year to support field surveys and construction compliance. Today, Merjent provides a wide range of professional consulting services to the oil & gas, biofuels, electric power, wind & solar energy, transportation, construction & manufacturing, and mining sectors. We also provide third-party contractor support and other services to government agencies across North America. For an overview, please visit the What We Do page. Merjent stands apart from other firms in how we work with clients and the values that guide us. Our management is committed to promoting an environment where people and projects succeed and we include our clients in that goal — building long-term relationships and providing a leading standard of client care that helps our clients to succeed. Visit our Where We Are page to identify a contact and start a discussion about how we can help you and your project succeed. Photo: Merjent founders at a corporate gathering in 2016. 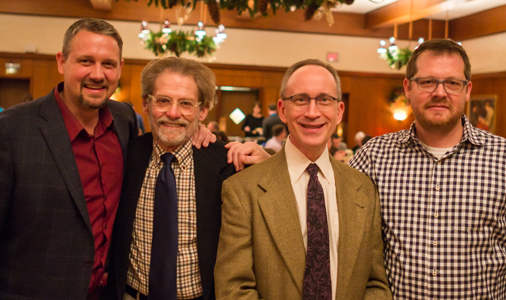 (Left to right): Tom Janssen, Steve Elbert, Bill Regan, and John Muehlhausen.